Easter is fast approaching and I've been busy creating decorations. 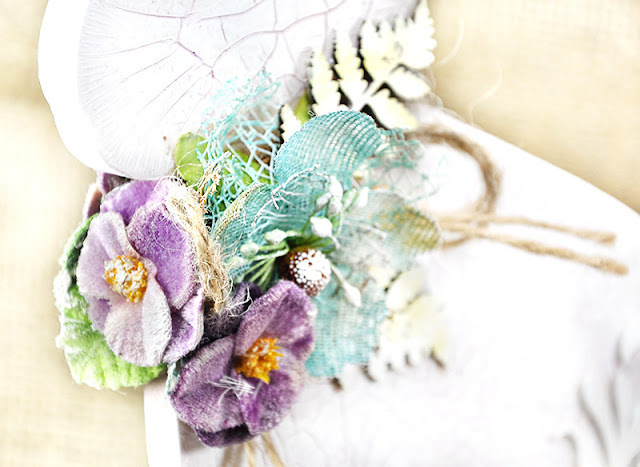 Petaloo flowers are an essential part of my decorations adding cheer, pops of color and that extra gorgeous Spring touch. This is a table centerpiece created for the season. 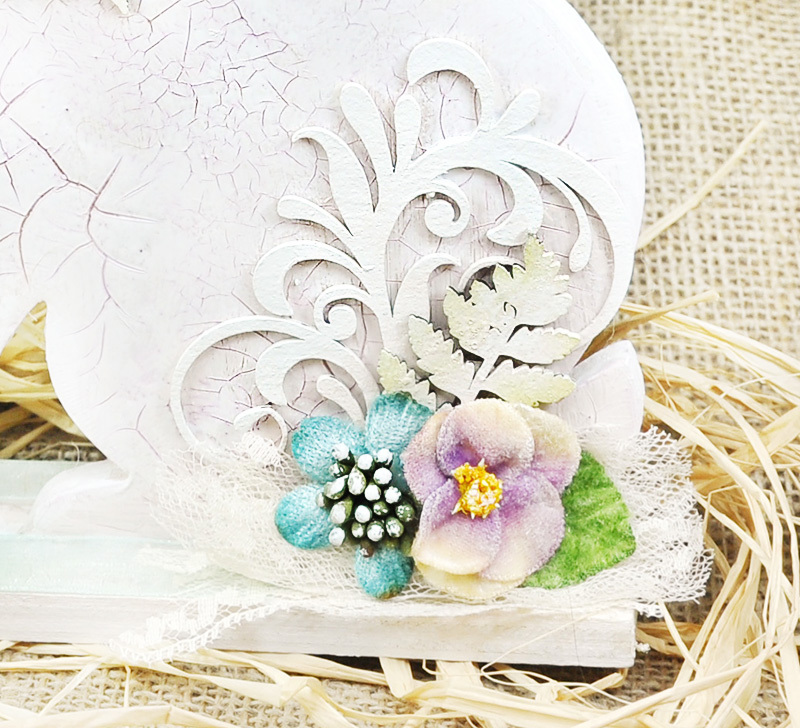 It features some of Petaloo's exquisite fabric flowers in cheery purple and teal. I think of those as wonderful Easter colors. 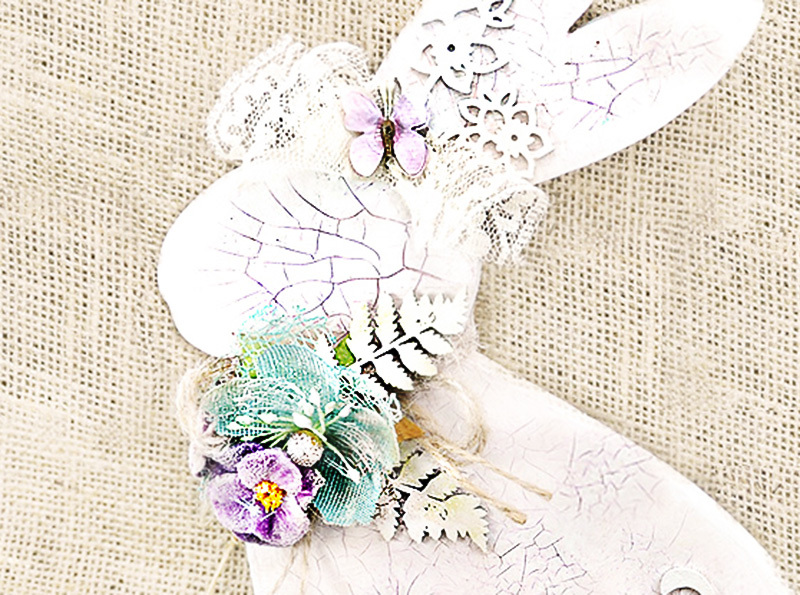 Petaloo Darjeeling Mini Butterflies in Purple , adds a darling little touch. 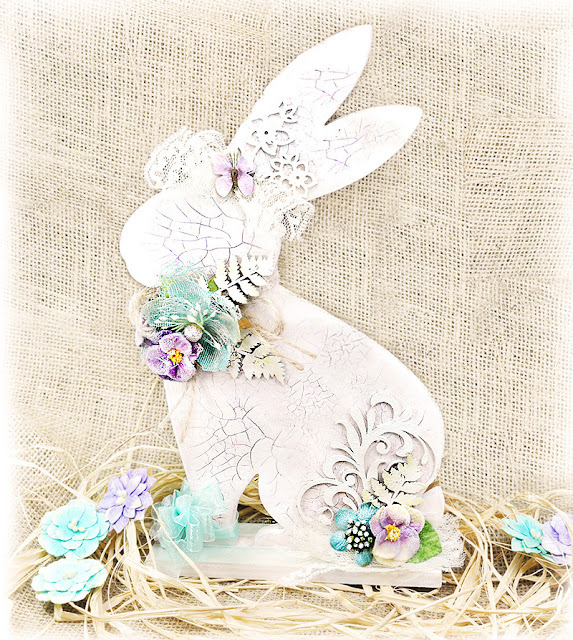 I also embellished the bunny with some painted chipboard pieces from Creative Embellishments. 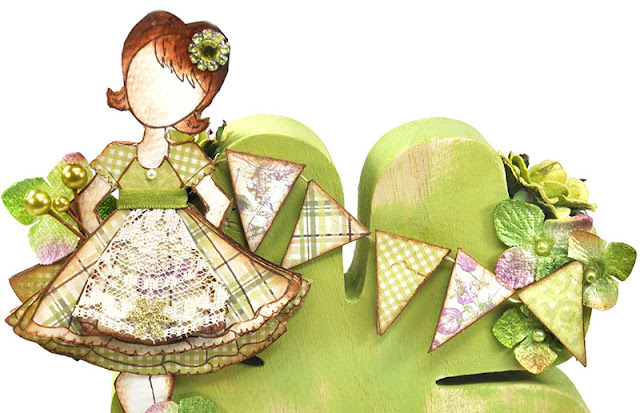 You can see more wonderful chipboard creations on their blog, here. I wanted the chipboard to be soft and subtle so they are simply painted white with a dab of green green distress ink. Flourish 11 was used on the ears. In the image above, you will also find the same Petaloo flowers as I have at it's neck. I have provided a side view to show some dimension. As for the bunny shape- I purchased an unfinished wooden Easter bunny shape. I painted with white acrylic paint and added a layer of crackle medium to it after it dried. This process took a few days since the crackle medium had to be thoroughly dry before I moved on to the fun embellishing phase. Since this is a dimensional project to be placed on a tabletop, I needed to address both sides of the bunny and could only do one side of the bunny at a time. This is a pop-up card I created for a great friend who recently had surgery. 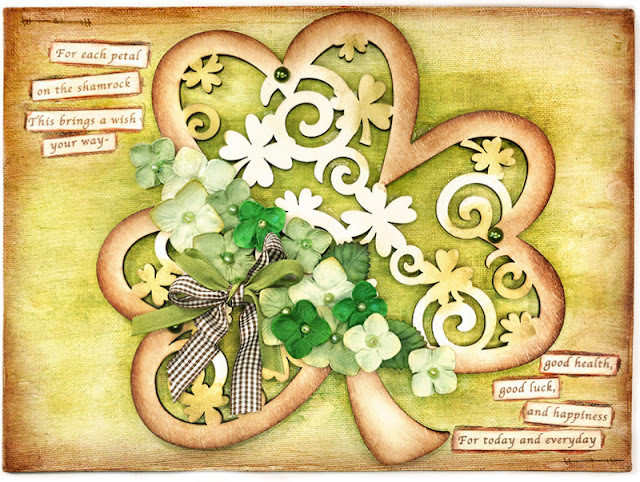 I love pop-up cards because they are so unassuming -but open it up and it's like a pop of smiles. And that's sort of how I feel when I make them lately. 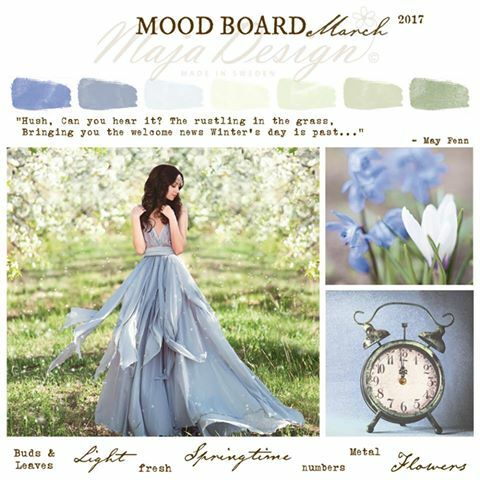 I created this for Maja Design Mood Board for the month of March. I used the Maja Design Papers - Life in the Country collection for this card as a perfect pairing for the Mood Board. 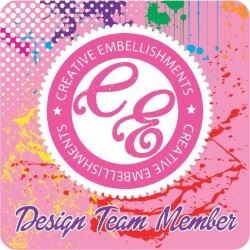 So what does it take to participate in the Mood Board? You do need to use Maja Design papers but you can interpret the Mood Board any way you like. Use any of the images as your inspiration. Or perhaps the colors speak to you as inspiration. You can also use the quote or even the inspiring words as your jumping point for the challenge. There are no rules other than the ability to meet the deadline. 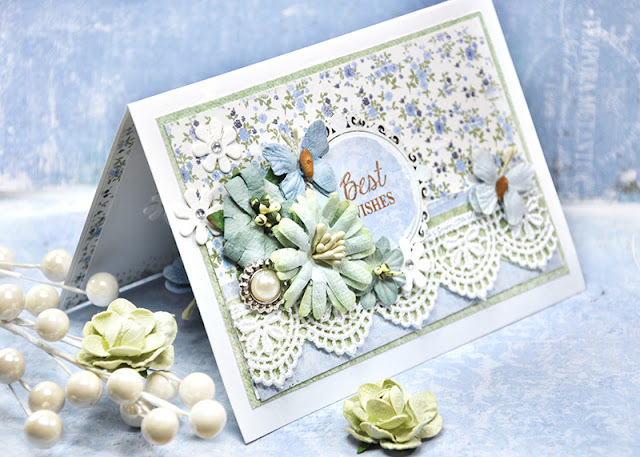 I'm tell you a bit about the products used on this happy card. 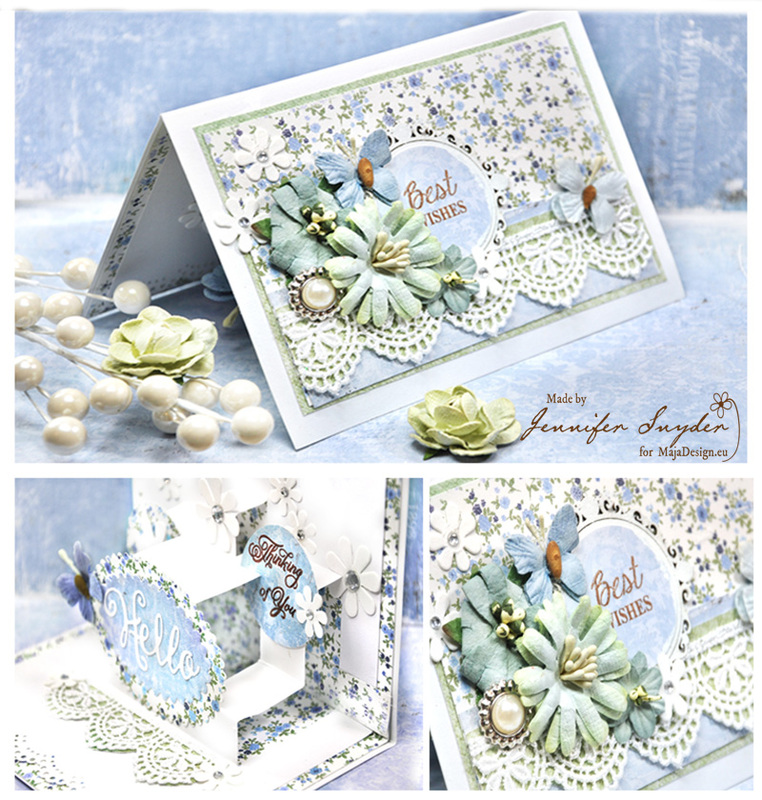 I mentioned previously the paper collection used from Maja Design. This is Life in the Country - it's fresh and happy in my opinion. Perfect for someone straight out of surgery and in need of a smile. The gorgeous flowers are from Petaloo. 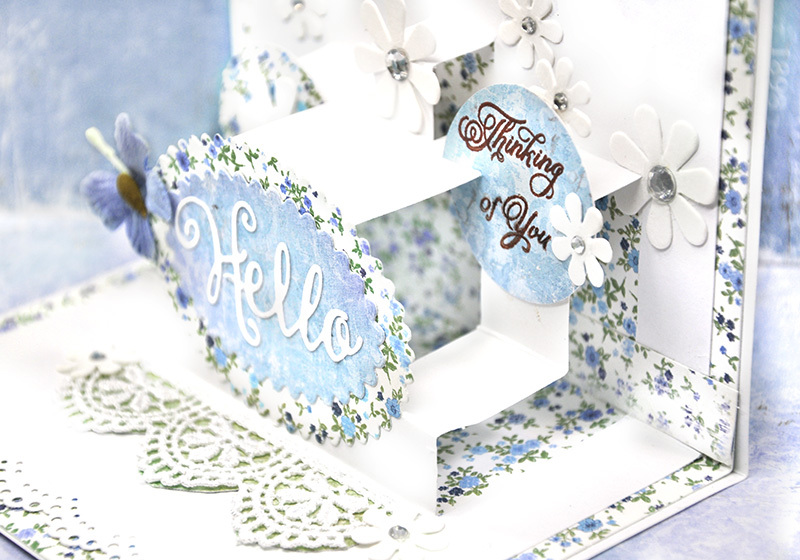 I chose soft soothing colors that resembled the little flowers on the patterned papers. The stamps and dies I used on this card are from JustRite Papercraft. Thanks for stopping. Have a joyful day full of good health. I do not want to be sending a "get well" card to anyone. Those are never fun to make. 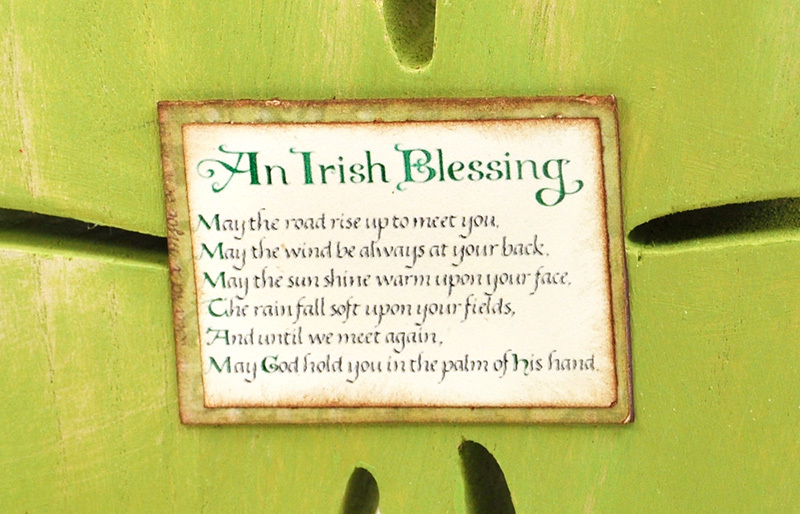 I added the Irish blessing from this post to the back of my decor piece. I thought it would be a nice subtle place to add it. I didn't want to totally clutter the front. 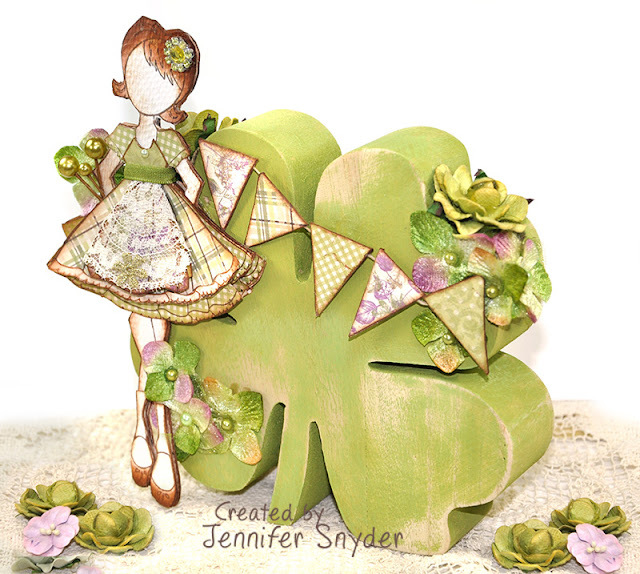 OK- actually when I added it to the front, my husband looked at the piece and said my shamrock shape now looked like a green tooth because I was hiding too much of the shamrock shape. A giant green molar! That's what my "artistic" husband said. I walked away muttering things like, "he has absolutely no sense of creativity", "what does he know", and simply "ugh blah grrrrrrr". Warning...never ask for advice and opinions unless you are prepared to accept what you hear. It can be harsh. 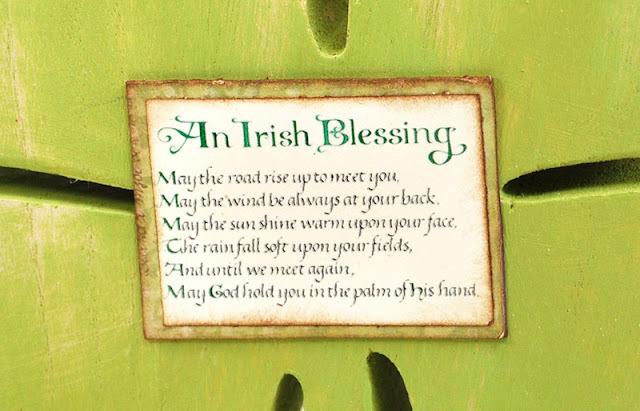 Soooooo I went back to my craft table and immediately moved the Irish Blessing to the back because he was sort of right. 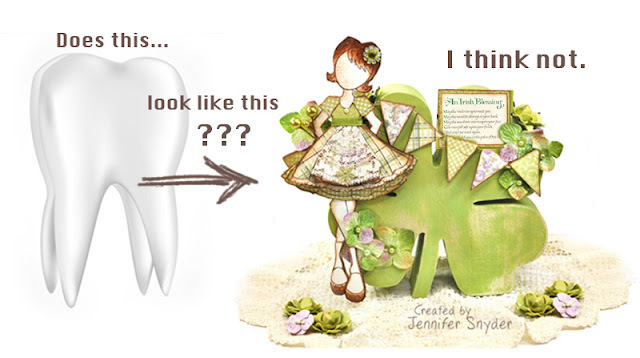 I'm only gonna admit to him being "sort of" right - because it didn't look like a molar for heaven's sake. It's fabulous to celebrate using favorites. 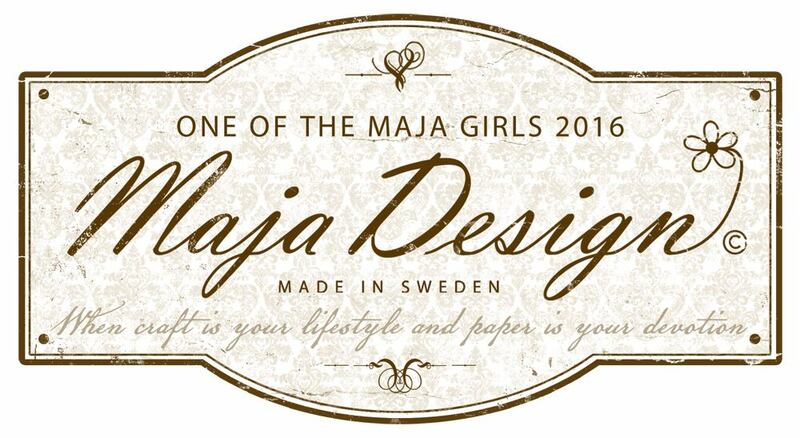 In fact, the paper I chose from Maja Design is also my favorite collection, FIKA. I am drawn to the purple and green combination. Petaloo - Burlap and Canvas Collection - Burlap Picks - Teal . 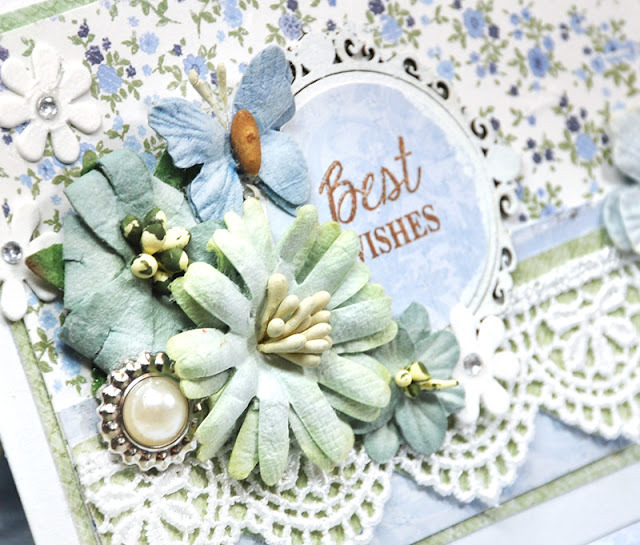 I didn't use the leaves from the floral pick, but I stole to berries from the pick to use as embellishments. I'll save the teal leaves for a different project. Here are some additional close ups of my festive home decor piece. with the banner I made also using Maja Design papers. The wood shamrock shape is from JoAnn Fabrics's FabLab collection for St Pat's Craft. It comes in natural wood and I painted it with Prima Marketing - Chalkboard Paint-Golden Olive. After it dried, I gave it a simple quick sanding. My doll Julie Nutting doll is Candie. I selected Candie because in my mind, she resembles an Irish dancer. 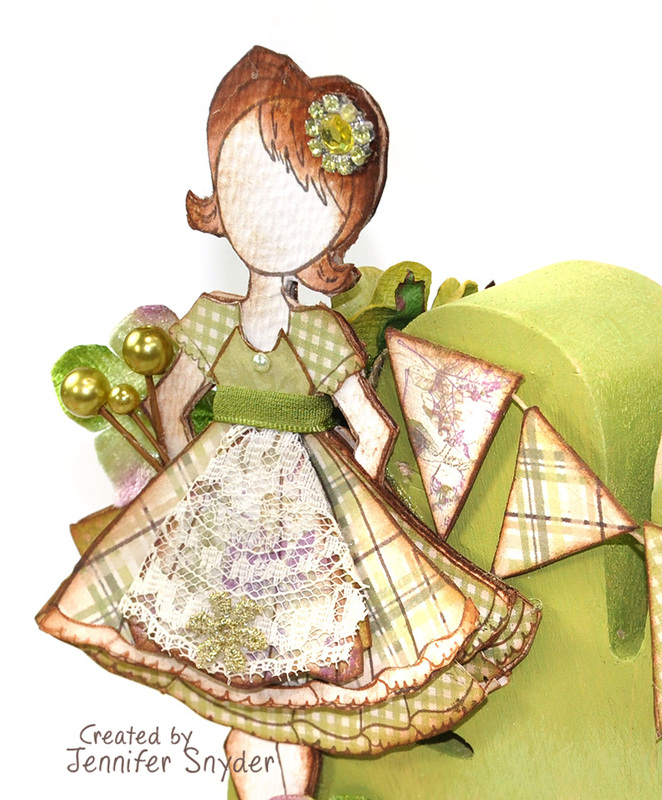 I stamped her dress several times and layered it for a full ruffled effect. When I use dolls for home decor projects, I like to make them so they have some durability. The actual doll form ( without clothing) is 3 layers thick - 2 layers of watercolor paper so I could use watercolors for her hair and shoes...plus an inside layer of thin cardboard or chipboard for support. I also sandwich something very durable for extra support in the vulnerable areas of the doll such as the neck and the legs. I don't want them to eventually bend and crease. I tend to use a small piece of wood skewer for this, but a piece of wire or toothpick will also work (and again with the tooth theme...ugh). 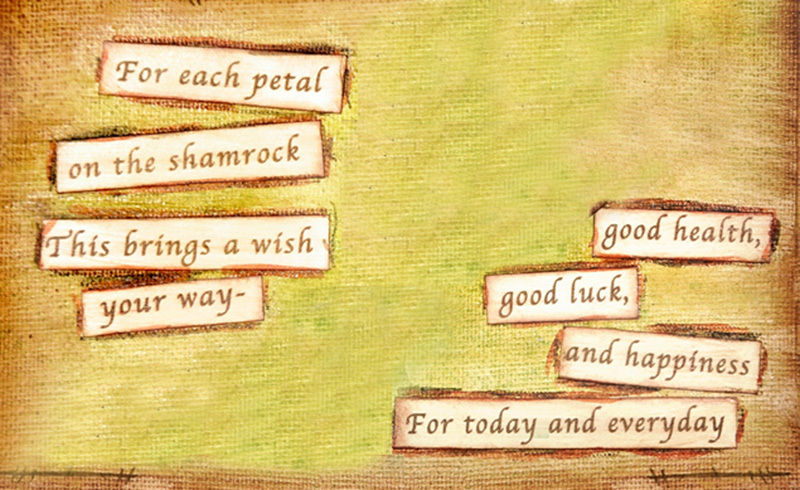 Here is another image of the Irish Blessing found ON THE BACK of the shamrock. A final last view of the completed piece with the Irish Blessing located in it's final resting place. Haaaaaa. This piece is available in my ETSY shop while it lasts. You can find it right here. 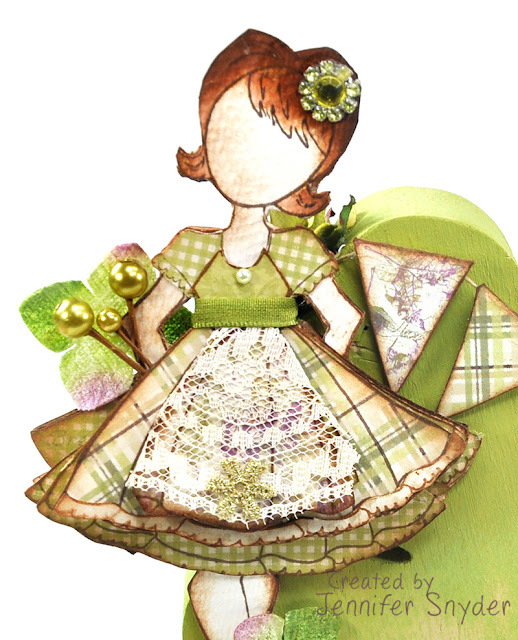 Some details - the finished piece with doll is 7"x7"x2.5" with the decor added. 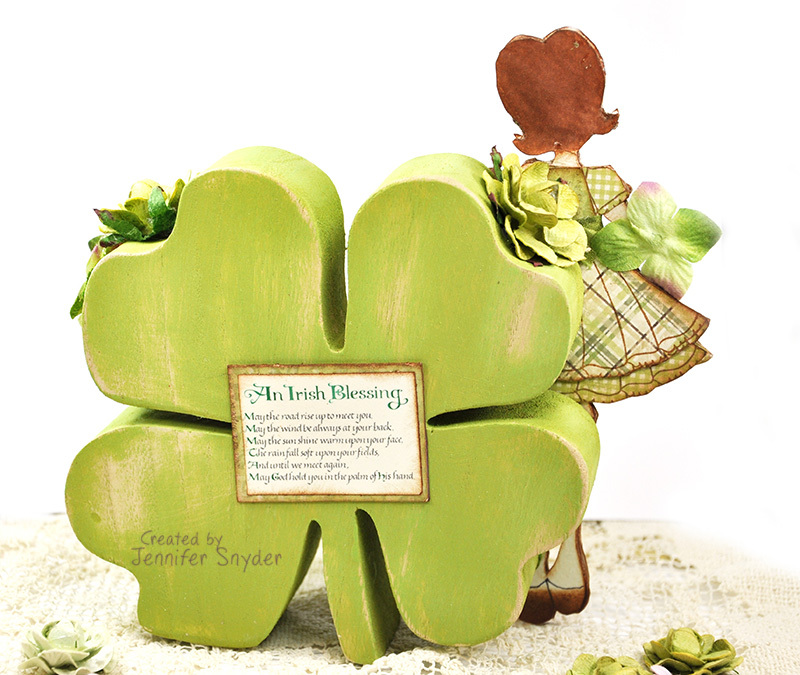 The actual shamrock shape is 5"x5"x1.5"
This is a home decor piece that stands securely on it's own. You can place it on a shelf, on a dresser or use as a tabletop centerpiece. 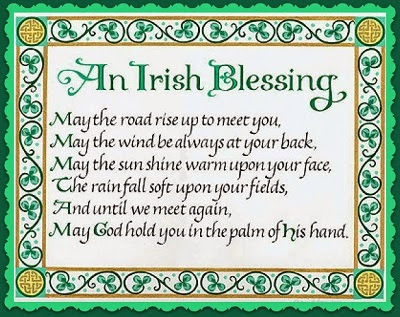 It does not say St Patrick's Day on it, so you can leave up all year round. You can follow Petaloo on their blog right here. You can also follow them on Facebook right here and never miss a thing. 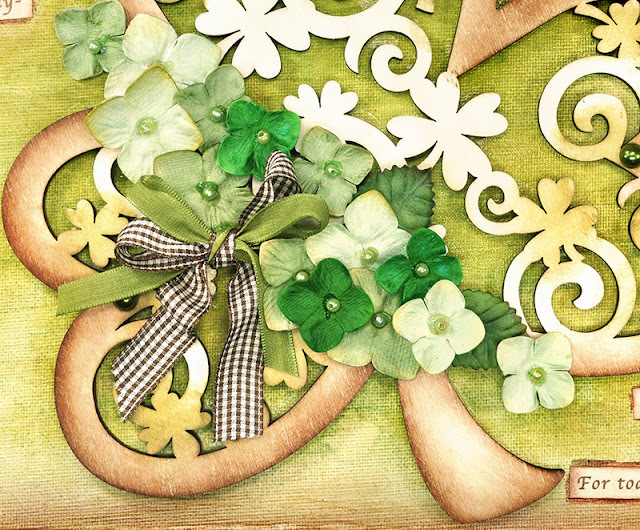 I am sending wishes for good health, good luck and happiness adorned with tons of green festive Petaloo Hydrangeas. 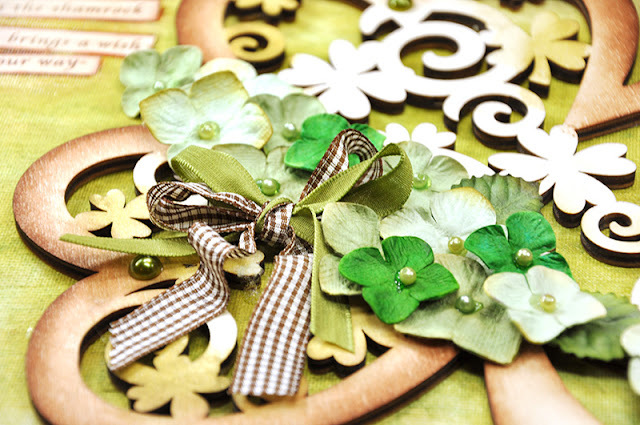 St. Patrick's Day is right around the corner - a celebration of all things green and Irish. As the saying goes, "Everyone is Irish on St. Patrick's Day", including Petaloo. 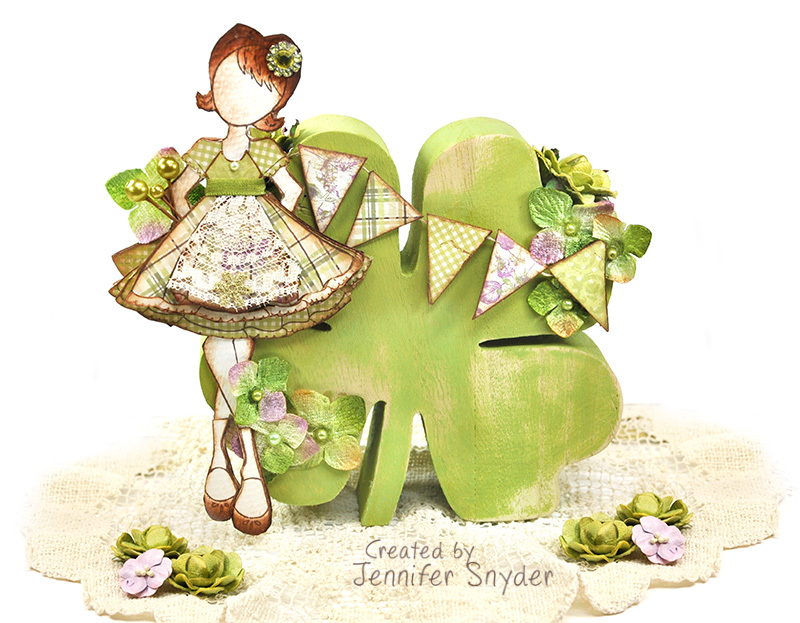 Luck is never out of style or out of season and everyone could use luck - so I'm calling this a year-round piece. It's also available in my ETSY shop while it lasts. You can see it right here. You can see that I have adorned my canvas with Petaloo Darjeeling Hydrangeas in Green. While the Hydrangeas are not clovers, they certainly are great substitutes. 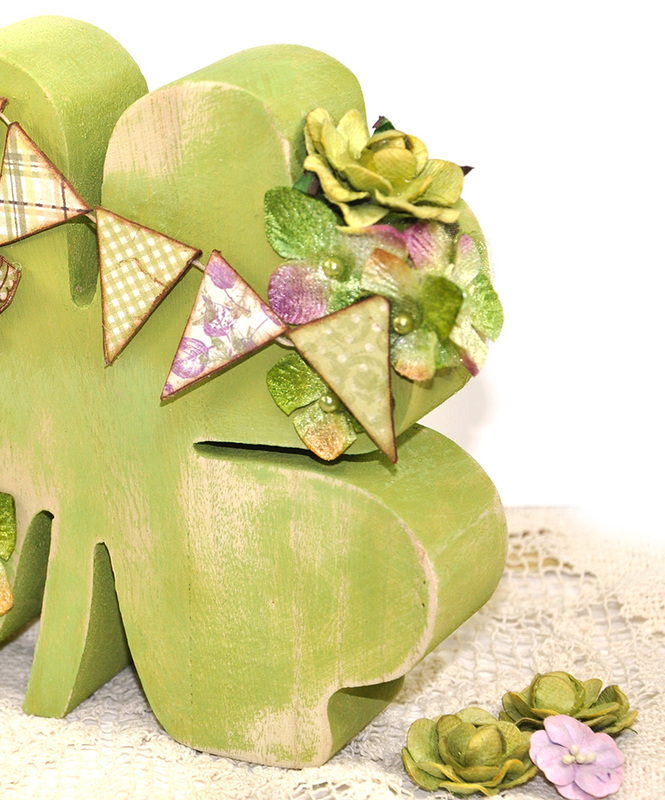 They are cheery, fun and the package comes with a great mix of greens. My project was created using a 9"x12" canvas board. 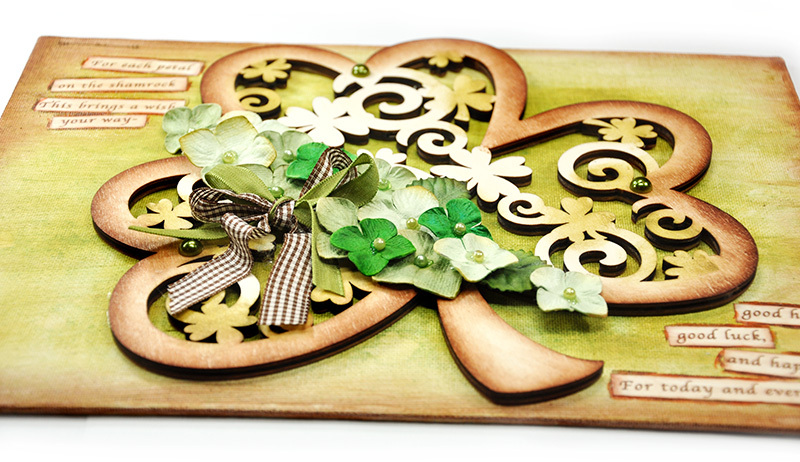 I bought a separate wooden clover shape from JoAnn's and thought it would be a cool piece to hang for those who love seasonal decor. My husband plays in an Irish Band so St. Patrick's Day is a big deal around my house. I added an edited version of the sentiment on the canvas so you can see it easier. and one last look at the finished project - with a sense of the dimension of the project. You can find this piece and many others in my ETSY shop - right here. 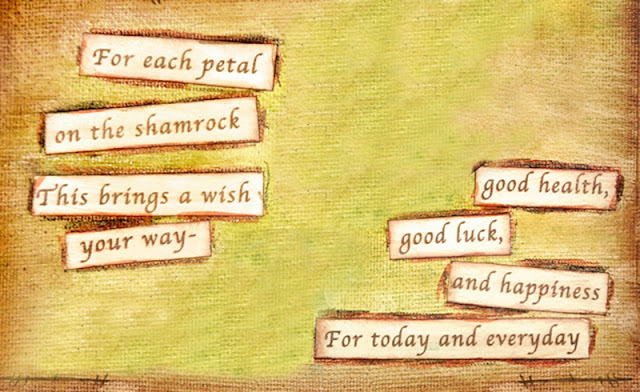 Be the lucky one to grab it before some other leprechaun dances away with it. It would look great framed or sitting on a stand for the season and year round. Luck is never out of season.